President Trump has appointed National Civic Art Society President Justin Shubow to the U.S. Commission of Fine Arts, an independent federal agency that oversees the design and construction of all buildings, monuments, and memorials in Washington, D.C.
Shubow will join six other presidential appointees on the commission to review all new projects in accordance with the 1901–1902 McMillan Plan, which laid out the National Mall and surrounding monuments. The commission was started in 1910 and has since assisted the District in building out its ever-evolving landscape. In 2012, Shubow testified to the U.S. House Subcommittee on National Parks in an effort to pass a bill that would nix Gehry’s design for the memorial once and for all. The bill didn’t pass, and the Commission of Fine Arts approved a revised preliminary design for the project. Congress appropriated $150 million to the memorial in 2017 and the city broke ground on construction last fall. It is scheduled to be finished on May 8, 2020. Shubow has an extensive background discussing architecture, having written about the field for Forbes and served as the current executive director of Rebuild Penn Station. He’s also lectured widely on architecture at universities across the U.S., although he was not trained in the field. 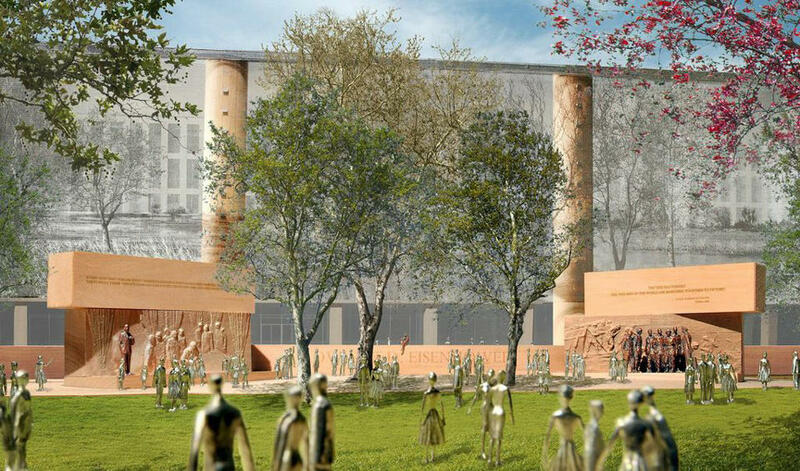 Eisenhower Memorial US Commission of Fine Arts Washington, D.C.